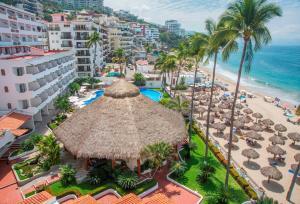 In the Mexican state of Jalisco is Puerto Vallarta. Its many attractions have made it a highly reputed tourist destination and it attracts more and more visitors every year. Its development began in 1964 following the shooting of John Huston's legendary "The Night of the Iguana". Since then, she has served as decorator for many productions. 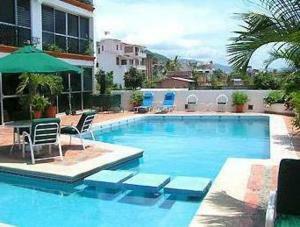 This popularity is explained by the presence of beautiful beaches and its proximity to the Sierra Madre Occidental. Nicknamed today the pearl of the Pacific, the great diversity of its environments allows a multitude of activities. Diving, surfing or even trekking in the mountains, anything is possible. Cultural and sporting events such as the film festival or the international golf tournament are organized throughout the year. You will find in Puerto Vallarta many beaches very pleasant. Divided into several zones, each one has its own specificities. North of the city is the Gold Beach or Playa del Oro. Known to be one of the largest beaches in Puerto Vallarta, it is still abundantly frequented. The few rocks that cover it contribute to the charm of the place. But, the most popular beach is the Playa de los muertos located south of the city. 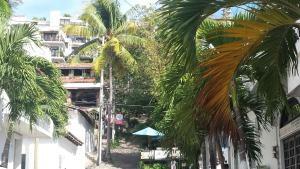 It is part of the "zona romantica" of Puerto Vallarta. The Playa de los Muertos enjoys a warm, golden sand. You can enjoy one of its many bars in a very relaxing atmosphere. The beach is connected to the hotel zone by the famous sea-bottom walk "la malecon". This walk, known for its statues of bronze and sand, will offer you a pleasant moment. Also enjoy the beach of las gemelas and its clear water. Composed of two parts separated by a pile of rocks, this stretch of fine white sand is ideal for swimming or kayaking. If you go further south, you will come across Mismaloya beach. Located at the foot of very green mountains, this beach owes its popularity to John Huston who used it as a decor. If you prefer smaller, secluded beaches, head to Gaza Blanca Beach. Not very crowded, it is perfect for relaxing. Between Las Gemelas Beach and Mismaloya Beach is the fabulous Los Arcos Marine Park. A place dreamed of for diving, it has seabed composed of real wonders such as tunnels or underwater cellars. You will come across a varied and unusual aquatic fauna. The sensation felt as it penetrates a dark tunnel, buried under the deep waters of the Pacific, is inexplicable and unique. Back on the sand, go to the beach Las Animas. Its sand, a golden color will charm you. It is divided into two parts, a first frequented by tourists, and a second for private use. Nearby you will find a few good quality restaurants, where delicious seafood dishes are on offer. The products are fresh and the welcome very warm. Another very attractive beach: Conchas Chinas, which is distinguished by its very végéation. You will find natural pools surrounded by rocks and discover a varied and fascinating aquatic fauna. In Mahajuitas, a fine white sand awaits you. The jungle dominates this part of the coast, and you will come across a few unusual animals. Puerto Vallarta has many other equally attractive beaches offering a wide range of activities such as sailing, water skiing, surfing and kitesurfing. The surroundings of Puerto Vallarta are also suitable for mountain biking or climbing. If you're looking for cold sweats, sign up for an adventure sports trip and explore the Sierra Madre Mountains. Thus, you will reach unforgettable panoramas and will cross very wild natural spaces, populated with a fascinating fauna and a flora. Puerto Vallarta is an ideal destination for all adventure sports fans who want to discover new horizons. Every Sunday night there is a party on the Malecon. This magical place comes alive, and welcomes many musicians in a warm atmosphere. The Malecon is also an exceptional place to contemplate the sunsets. Every night you can watch this sumptuous show that will delight couples. Feel free to visit the old town of Puerto Vallarta. As you move away from the coast, you will pass by the beautiful Plaza de Armas, the main square of the city. This old neighborhood is full of lovely colonial houses. The charm of the old quarter is undeniable and you will spend many hours browsing its busy streets. You will find the amphitheater Los Arcos, a real symbol of the city. The latter hosts free shows every night. Going further north of the Cuale River, you will come to Gringo Gulch, which overlooks the bay. You will be very well received in old Puerto Vallarta and locals will be happy to chat with you and to show you around. Puerto Vallarta is also a destination very appreciated by gourmets. Its local gastronomy is reputed and the city offers a multitude of restaurants. For a little hunger, head to a tapas bar. Every year, the largest restaurants in the city organize a gastronomic fair, which lasts about ten days. Every year, the international gourmet festival welcomes top chefs from all over the world to create real culinary works. It is one of the major events of the city and takes place in mid-November. The posh restaurants are mostly beachfront. You will taste the many local specialties, which are often composed of freshly caught fish. Well-known chefs such as Bernhard Guth and Ulf Henriksson have opened a restaurant there. In this delightful deco, you will savor typical dishes of the Mediterranean cuisine. The Arrayan offers you Mexican specialties to discover absolutely. The most curious will be tempted by locust tacos. The wine list is varied, and the colorful decoration of the restaurant makes the meal very enjoyable. Puerto Vallarta enjoys a very dynamic nightlife. Throughout the Malecon, you will find many bars and discotheques in which you will spend frenzied evenings. At the Bodeguita del Medio, a disco on the waterfront, you'll dance to crazy Latin rhythms. You can also discover the El Zoologico Club, whose Aytpian interior is decorated with head of animals. With the company Vallartas Adventures, you will participate in a night excursion. The boat Ritmos de la noche will take you to Las Caletas, where the famous John Huston built his house. From late October to late May are the walks of art. Every Tuesday evening are scheduled various exhibitions in galleries, all in a pleasant and relaxed atmosphere. Puerto Vallarta is a destination full of assets, and its sumptuous landscapes await you in this city, where you can savor every moment. BRAND NEW LUXURY CONDOMINIUM THREE BLOCKS FROM THE BEACH. The closest airport to Puerto Vallarta is Gustavo Diaz. It provides links between the city and the rest of Mexico, but also with some destinations in the United States and Canada. Once arrived, taxis and shuttles go directly to the city center. You can also go to Puerto Vallarta by bus. The bus station is connected to the main cities of Mexico. The buses are quite comfortable, and you will enjoy beautiful scenery. In Puerto Vallarta even, there are buses all over the place, and you will easily reach the desired place. Ideally landscaped, the city is also very pleasant to walk. You can also take a taxi, the fares are very reasonable. If you want to discover the region and move freely, it may be interesting to rent a car. Book in advance via the internet and enjoy the best prices. Discover the puerto vallarta's international relations with partnership cities and friendship cities.